Jesus often said two words when calling His disciples: “Follow Me.” Jesus emphasized that entering into a relationship with Him involved more than belief. It also involved commitment. Jesus said, If anyone would come after me, he must deny himself and take up his cross daily and follow me (Luke 9:23). Upon belief, you and I begin a journey with Jesus that lasts for eternity. He leads; we follow. A person is saved by faith alone. Salvation comes by grace through faith in Jesus apart from works. 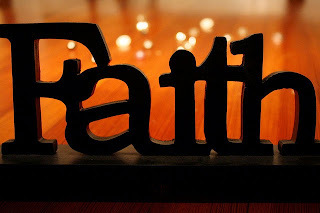 (Ephesians 2:8-9) But what is saving faith? Faith is believing God and acting upon that belief. Martin Luther once said, “The true, living faith, which the Holy Spirit instills into the heart, simply cannot be idle.” Living faith is evident when a person confesses, “Jesus is Lord.” (Romans 10:9) Living faith is evident when a believer’s spiritual eyes are opened to God’s truth, and he follows that truth. Living faith is evident when a believer follows God’s call to service even though he feels inadequate. workmanship [His own master work, a work of art], created in Christ Jesus [reborn from above—spiritually transformed, renewed, ready to be used] for good works… (Ephesians 2:10 AMP). A life of joy, meaning, and amazement awaits those who step out in faith and follow Jesus every day! Faith and Action—what a wonderful couple! Lord, thank You for the gift of faith. Help me daily act in faith upon Your Word and prompting.